In implementation of the Joint Statement issued during the State Visit of H.E. Mr. Tran Dai Quang, President of the Socialist Republic of Vietnam to India in March 2018, the Embassy of India, Hanoi in coordination with People’s Committees of Vinh Phuc and Phu Tho provinces and the Bhagwan Mahavir Viklang Sahayta Samiti (BMVSS) is organizing the Jaipur Foot Artificial Limb Fitment Camp in the months of July-August 2018 to provide rehabilitation services and the prosthetic Jaipur Foot to around 500 Vietnamese people in the provinces of Vinh Phuc and Phu Tho. The idea of organizing the Jaipur Foot Artificial Limb Fitment Camp in Vinh Phuc and Phu Tho provinces received encouragement from Her Excellency Madam Nguyen Thi Hien, Spouse of State President Tran Dai Quang. A delegation comprising 7 technicians led by Mr. D.R. Mehta, Founder and Chief Patron of BMVSS is in Vietnam for implementation of this programme. The idea of organizing the Jaipur Foot Artificial Limb Fitment Camp in Vinh Phuc and Phu Tho provinces received encouragement from Her Excellency Madam Nguyen Thi Hien, Spouse of State President Tran Dai Quang. During the State Visit of His Excellency Tran Dai Quang, President of the Socialist Republic of Vietnam to India in March 2018, Her Excellency had accompanied the State President and visited BMVSS’s Jaipur Foot Centre in Delhi and reviewed their Jaipur Foot, Limb fitment and rehabilitation services. She expressed her desire that persons with disability in Vietnam be rehabilitated with Jaipur Foot and Limb. The inauguration ceremony was held on 10th July 2018 at Vinh Phuc Convention Centre. 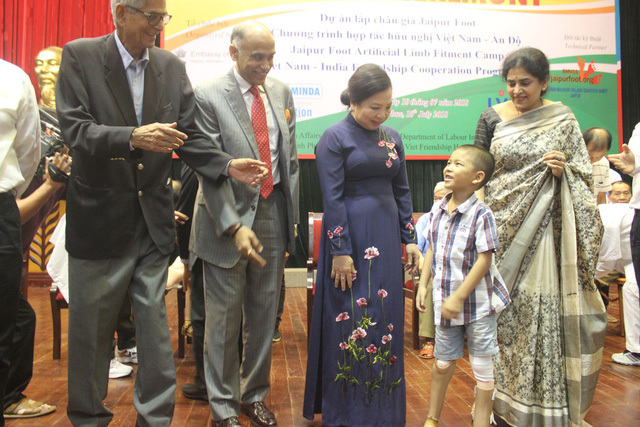 Her Excellency Nguyen Thi Hien, the First Lady of Vietnam inaugurated the Jaipur Foot Artificial Limb Fitment Camp. 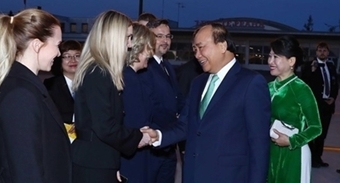 A number of dignitaries including Hoang Thi Thuy Lan, Member of Party Central Committee and Provincial Party Secretary of Vinh Phuc Province, H.E. Mr. Pham Sao Mai, Assistant Minister of Foreign Affairs, H.E. Mr. Nguyen Van Tri, Chairman of People’s Committee of Vinh Phuc province, His Excellency P. Harish, Ambassador of India to People’s Republic of Vietnam and his spouse Mrs P. Nandita, Mr. D.R. 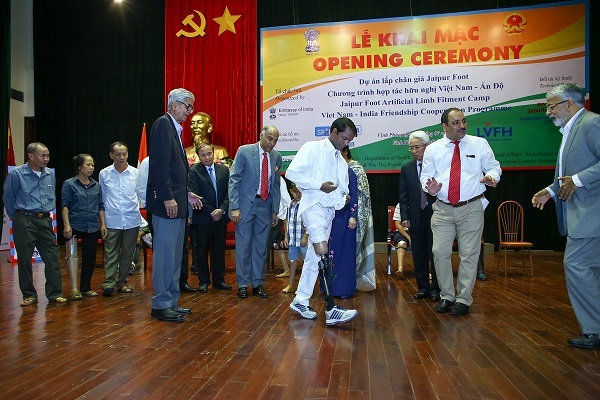 Mehta, Founder and Chief Patron of Bhagwan Mahaveer Viklang Sahayata Samiti, Jaipur, India, Dr. Nguyen Nguyen Dong, Director of Lac Viet Friendship Hospital, Vinh Phuc, and Mr. Sanjeev Saxena of Minda Group participated in the inaugural ceremony. Her Excellency the First Lady also visited the Jaipur Foot Camp and temporary workshop at the Lac Viet Friendship Hospital and met with persons with disability who have come to get the famous Jaipur Foot artificial limb. It is noteworthy that Vietnam is the first country in which the Jaipur Foot Artificial Limb Fitment Camp is being organized under the Agreement signed between the Ministry of External Affairs of the Government of India and Bhagwan Mahaveer Viklang Sahayata Samiti, Jaipur, India in November 2017. BMVSS was established in 1975 as a not-for-profit organization to serve persons with disability and give them mobility and dignity. Since its inception it has served more than 1.71 million persons with disability in India. It is the world’s largest organization for serving persons with disabilities. All it’s services are given free of cost to persons with disability. Besides India, BMVSS has organized 66 camps in 29 countries in Asia, Africa, and Latin America bringing mobility to over 26,000 persons with disability. It had earlier organized a camp in Hanoi in March 1994. The Jaipur Foot is the most used artificial Limb in the world. It permits a below knee amputee to walk, run, climb a tree, drive, and squat. Most of these functions can be performed by above knee amputees also. The Jaipur Knee was jointly developed with the famous Stanford University of the USA. The international news magazine TIME rated it as the 50 best inventions of 2009. In this camp both the Jaipur Foot and the Jaipur Knee will be used. M/s Spark Minda Vietnam, has facilitated the Jaipur Foot Artificial Limb Fitment Camp in Vietnam through coordination with various agencies and organizations, providing logistical and other support for the BMVSS team. Spark Minda Vietnam manufactures auto components in its state of the art manufacturing facility in Vinh Phuc, since 2013 and employs about 200 persons. It is part of the Ashok Minda Group, an India-based global automotive components manufacturer with 30 manufacturing plants in 11 countries. 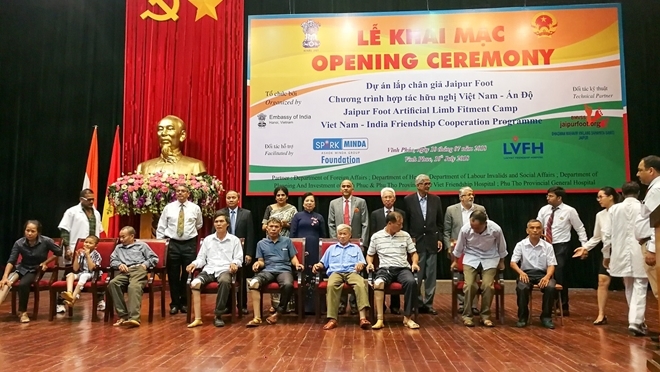 The camp and temporary workshop has been established in Lac Viet Friendship Hospital, which has made available space and other support in its modern facilities. After completing its work in the Vinh Phuc Province in about two weeks, the BMVSS team will set up the Jaipur Foot Artificial Limb Fitment Camp in Phu Tho Province. In all, under this humanitarian project, over 500 Vietnamese with disability will be provided artificial limbs in the next 5 weeks completely at no cost to them. The project represents a strong symbol of friendship and people-to-people cooperation between the two countries and is taking place just after both countries celebrated the Year of Friendship in 2017 to commemorate the 45th Anniversary of establishment of Diplomatic Relations and the 10th anniversary of Strategic Partnership.